Over the last few weeks, I have been researching the children of Elizabeth Skempton, to determine whether there were more grandchildren than I had in my family tree. Last week, I focused on Elizabeth’s 7th child, Priscilla Slawson, which just left Elizabeth’s youngest two children, Joseph Slawson, and Thomas Burgess Slawson. Thomas died when he was 14 years old, so he had no children. This post is therefore about Joseph Slawson. Joseph Slawson was born in 1849 at Geddington, Northamptonshire, England. I didn’t have a date of birth or christening for Joseph, so I checked Ancestry, and found his baptism record. Ancestry.com, “Northamptonshire, England, Church of England Baptisms, 1813-1912,” database and images, Ancestry.com (http://home.ancestry.com.au/ : accessed 11 Jan 2017); Joseph Slawson, baptism 30 Sep 1849, Parish of Geddington; Northamptonshire Record Office; Northampton, England; Register Type: Bishops Transcripts. Joseph appeared on the 1851 and 1861 census with the rest of the family. The 1871 Census has an entry for a Joseph Slawson at Bury, Elton, Lancashire. He was a private in 100 Regiment. Although his birthplace was listed as London, Middlesex, I have only found one other Joseph Slawson who was born about 1849. The other Joseph Slawson was born at Whiston, Yorkshire, and in 1871 was living at Rotherham, Yorkshire. Joseph Slawson married Ellen Dimon on 18 June 1874. 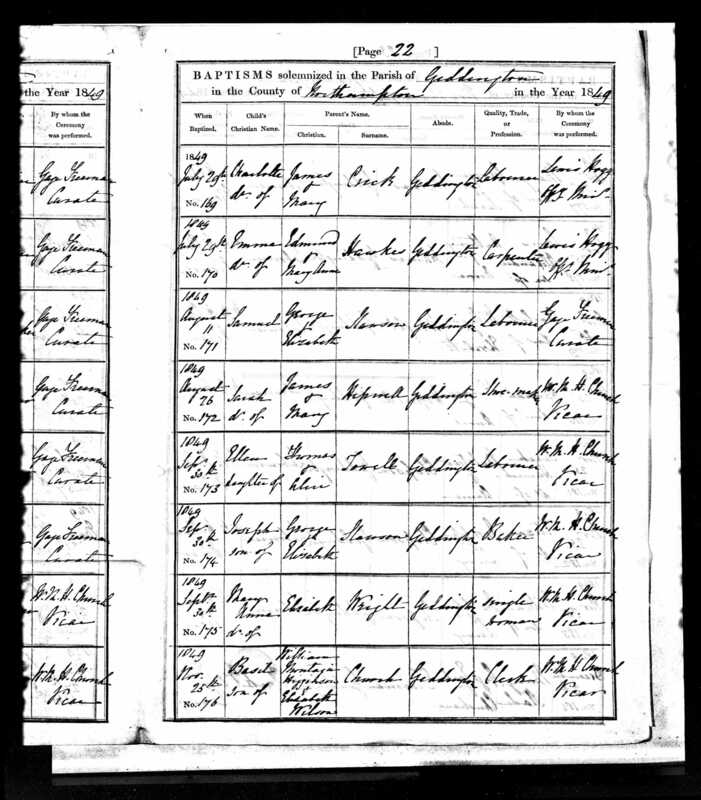 Ancestry.com, “Warwickshire, England, Church of England Marriages and Banns, 1754-1910,” database and images, Ancestry.com (https://www.ancestry.com.au/ : accessed 11 Jan 2017); marriage entry for Joseph Slawson and Ellen Dinon, 1874 (18 June), St Michael, Coventry; Warwickshire County Record Office; Warwick, England; Warwickshire Anglican Registers; Roll: Engl 09000 36; Document Reference: DR 90. The 1881 census shows Joseph and Ellen were living at the Barracks in Lidford, Devon. Joseph was an assistant warder. Also in the household were their children, Gertrude E, age 5, Ellen M. age 3, Ida F. age 1 and Hilda J. age 6 months1. In 1891 the family were living at 61 Tavistock Road, in the village of Prince Town, Civil Parish of Lydford. The following children were living with them: Ella M. age 13, Ida F. age 11, Hilda J. age 10 and Gervase C. age 42. In 1901 the family were at 1C Block, Government Estate, in the village of Prince Town, Civil Parish of Lydford. Joseph was Principal Warder Prison Services. Also in the household was wife Ellen age 51, daughter Hilda J. age 20, son Gervase C. age 14, and niece Ellen Dimon age 103. In 1911 Joseph Slawson, age 62, was living at Hallowell Cottage, Bere Ferrers. He was a widower, and his occupation was civil service pensioner. Also with him were daughter Ella Mary Slawson, age 33, and daughter Ida Florence Slawson, age 31. Since there is a 6-year gap between Hilda and Gervase, there may have been other children born between 1881 and 1891, who died before the 1891 census. I therefore checked FreeBMD for any births for the surname Slawson between 1881 and 1891 in the county of Devon. The entry for Gervase was the only entry, so Joseph only had the 5 children. Joseph died 29 November 1943 at Plympton St Mary, Devon5. FamilySearch., “1881 British Census.” Database.(FamilySearch. FamilySearch http://www.familysearch.org/ : 2002), (http://www.familysearch.org/ : accessed 23 Apr 2005), entry for Joseph Slawson, Barracks, Lidford, Devonshire; PRO RG11 Piece 2218 Folio 112 Page 25. England., 1891 census of England. Digital images. (ancestry.com. ancestry.com.au. http://www.ancestry.com.au/ : 2009), 61 Tavistock Rd, Lydford, Devonshire, folio 26, page 10, Joseph Slawson; digital images, ancestry.com, ancestry.com.au (http://www.ancestry.com.au/ : accessed 15 Jul 2009); citing PRO RG 12/1750. England., 1901 census of England. Digital images (ancestry.com. ancestry.com.au. http://www.ancestry.com.au/ : 2009), 1C Block, Government Estate, Lydford, Devonshire, folio 106, page 21, Joseph Slawson; digital images, ancestry.com, ancestry.com.au (http://www.ancestry.com.au/ : accessed 15 Jul 2009); citing PRO RG 13/2117. 1911 census of England, Hallowell Cottage, Bere Ferrers, Joseph Slawson, age 62; digital images, ancestry.com, ancestry.com(http://home.ancestry.com.au/ : accessed 11 Jan 2017); citing RG 78, RG 14 PN 13063, registration district (RD) Tavistock, sub district (SD) Calstock, enumeration district (ED) 1, schedule number (SN) 6. Public Record Office, UK, “England & Wales, National Probate Calendar (Index of Wills and Administrations),1861-1941,” database, ancestry.com.au (http;//www.ancestry.com.au/ : accessed 11 Jan 2017), Joseph Slawson, death date 29 Nov 1943, probate date 18 Mar 1944; Principal Probate Registry. Calendar of the Grants of Probate and Letters of Administration made in the Probate Registries of the High Court of Justice in England. London, England © Crown copyright. Ancestry.com, “England & Wales, Civil Registration Death Index, 1916-2007,” database, Ancestry.com(http://home.ancestry.com.au/ : accessed 11 Jan 2017), entry for Joseph Slawson, volume 5b, page 352, Dec quarter 1943, Plympton district; citing the General Register Office’s England and Wales Civil Registration Indexes.